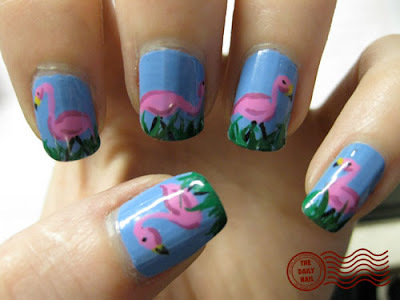 I used Orly Snowcone as a base, with Massini Power Pack for the Flamingos, American Apparel Manila and American Apparel Hassid for the beaks, American Apparel Hassid for the eyes, and 'legs'. For the shadow on the body, I used a mix of the Massini Power Pack and Color Club Ms. Socialite. For the grass, I used Nubar Forest for the background grass, and Green Scene for the foreground grass. Topped it off with two lovely coats of Seche Vite top coat. oh so cute love these! Anon- thanks- I LOVE this color- it's awesome for application, its opaque AND pretty!!! Yet again... totally amazing! I LOVE these! Other great mani! You blow me away every single time! Absolutely awesome! I *love* lawn flamingos. :) Very nice mani. Love it! So creative and just really cute! Aaaaaagh! I am stealing this :D So cute. And also fitting at the moment, very Alice. HAHA That's too cute. Reminds me of Florida. Awesome! This just makes me *happy* ! Wow, you are so talented! I've seen a lot of nail art on other websites, but this one really impressed me because there's so much attention to detail...and because it's such a fun design! Nice work! These are awesome! You did a great job on the shading.